Our prices are flat rates which are to be paid through automatically recurring charges. No commission fees. Based on businesses with only one location, the flat rate would be $70 a month. For businesses with two locations, it would be $65 a month (per location) and for businesses with three or more locations it would $60 a month (per location), all features included! The one-time set up fee is $200. For us to do extensive menu/product list updates, that will be $20; however, with our software, clients are perfectly capable of doing so themselves. Tutorials are available. Do you all offer any marketing services for our business? Yes we do have a marketing department that will be able to market your business for an extra fee. Pricing is negotiable based on the required services. How will we know that we have gotten an order? Your business will be given an account on our website in which you use an email and a password to log in with. Once there (via laptop, tablet, ipad, or even mobile phone), you can open up what we call an orders dashboard. Any time an order comes in, an alert sound is made and the order pops up on the ordering dashboard screen. You can also get orders sent to various email addresses as well (perfect if you get email directly to your mobile phone). We also have the options of you getting text messages to notify you that you have an order, we have fax machine orders available, and we have automated call notifications as well. Can people pay online before picking up their order? Absolutely! We are integrated with two of the top online payment systems, Stripe and Paypal. Once you get an account with either of those two, it can connect directly to your business' bank account and any online debit or credit payments will go to your account. This helps to eliminate no shows. You can also have it to where people only pay when they pick up or you can give your customers an option to pay before or after they arrive. Why are your prices so low if your system is so good? We were originally designed to help small to medium-sized businesses in the local area, sometimes referred to as "mom and pop shops" because we want to be able to help smaller and independent businesses have the same luxuries that bigger chain restaurants and businesses have at an affordable price. However, if there is a bigger business that does not already have online ordering and would like to utilize our system, they are more than welcome. Absolutely not. We simply want your business to thrive and for us to be such a huge component to your success that you will choose to remain in business with us for years to come. Can we update our menu or product list on our own? Yes. You will have access to the backend of your online ordering website so that you can update your items, add pictures, create deals, etc. yourself and it updates immediately! We provide video tutorials in your account to show you the very simple process of how it is done. We do not do deliveries for you at this time; however, we do have it where customers can order delivery FROM YOU through the ordering page and with whatever specifications you desire, such as within a certain mile radius, deliveries available only for those who spend a certain amount, etc. We are working on having a team who can deliver for our clients within the city of Charlotte in the future. Yes, we are integrated with Open Table so that people can make reservations. If you aren't with Open Table, we also have a custom reservation form that you can make so that you can create your own information sections for customers to complete such as date, time, how many people, contact name, and contact phone number. As far as we know, our prices are better than the competition, hence we can save you more money. Other competitors charge around 12-15% of the online orders or a flat fee of over $100 for online ordering. In addition, we are local to the Charlotte area, so the owner will work with you directly and will be a phone call or even a drive away in case there are any questions or issues. We do not have problems with our site going down. You will be able to edit your menu and do a lot of things yourself without having to wait on us to do it (if you prefer) and we have video tutorials within the accounts of our clients to show you the simple steps on how to do so. And our online ordering platform keeps your brand at the forefront, so your logo, company colors, etc. are there on the online ordering page and isn't a generic ordering page like other platforms. Will this be within our own website? Yes. You will not need to be on a directory, so when people go to your website, they will be able to order online from it as well. Your brand stays at the forefront. What if we do not have a website? No worries, our online ordering page works perfectly as a standalone website for your business. Is the online ordering page mobile friendly? Absolutely. One of the biggest complaints concerning restaurant websites is that they aren't mobile friendly and most people will be visiting from their phones in order to see what's on the menu. So whether or not you have a website, our ordering page will work with and adapt to smart phones. Would our customers have to create an account to log into before ordering? Absolutely not. The only information a customer would need to enter would be their name, phone number and email address (so that they can get an email confirmation of their order). If getting it delivered from you, they would include their address as well. However, we do have the option available for people to create an account so that they will be able to order without having to continually enter all of their information if they intend to be a loyal customer. Do you have POS integration? Right now we can only integrate with the Square POS system; however, in the future we may be able to integrate with more systems. To IMMEDIATELY start your two-week freek trial, Click Here! 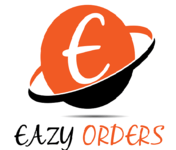 eazyorders.com . All rights reserved.